Many new bloggers think affiliate sales are the magical answer to earning online. They grab some random offers off ClickBank or slather their blog with automated ad banners, dream of making a fortune… and then wonder why they’re earning $1.50 a month. I recently reviewed more than 100 startup blogs and saw this over and over. I also know about the failed affiliate sales problem from firsthand experience—I put up an Amazon book cart widget in my sidebar when I first launched my blog, thinking that would be a cash cow. Um, no. Why doesn’t this work? Without huge volumes of traffic, you simply don’t have enough readers to earn well when a small percentage of them clicks your ad. That’s partly because the portion of people willing to click on ads is going down—it’s now less than 2 percent of viewers overall, a Doubleclick survey in April showed. Also, nearly 200 million people block ads now, a PageFair/Adobe study found. Worse, you’re sending any readers who do click away from your blog to buy somewhere else. That doesn’t help you build relationships with readers and gain their trust—and that’s the key to earning well as a low-traffic blogger. Affiliate sales have to be done in a careful, selective way on a small blog, to avoid damaging your reputation and to keep your audience growing. The popular bloggers may send you a new affiliate offer each week, but that’s unlikely to work for you. 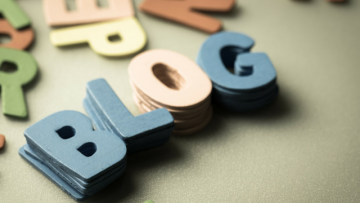 Fortunately, with a bit of care in choosing what and how you affiliate sell, low-traffic blogs can earn well—and far from being considered sleazy, you’ll get thank-you notes from your readers. I’ve earned $1,200 a year or more per affiliate offer using this method, and with virtually no marketing. The first step to affiliate sales success as a newbie blogger is to start talking to your readers. Yes, even if there are only 15 of them. Find out: Why are they reading you? What are their problems? What are they struggling with? You may think you know what readers of your blog topic would like to buy, but trust me, you’ll be surprised. For instance, I run a blog for freelance writers. But my biggest early affiliate-sales win was for a blogger community membership. It turned out there was a lot of crossover between writers who freelance for clients, and writers who want to earn from their own blog! I only discovered that by talking to readers and learning what their dreams encompassed. The better the “match” is between your subscriber needs and the affiliate offer the easier it will be to sell. I thought freelance writers would just want to buy books on copywriting or writing craft from me, but my research proved that wrong. Another unexpected discovery was that many new freelance writers needed tools for setting up their freelance business. These included accounting software, writer website setup help, web hosting, and mailing-list software—so these are the things I affiliate sell. Your market research will help you discover possible affiliate offers that will be well-received by your readers—and that may be totally off your radar. The plus here: If you offer something your readers really need, they won’t be offended, even if they don’t want to buy it right now. It feels like you care and want to help their business succeed, rather than that you’re just out to make a buck. Once you’ve figured out the types of products your people need, investigate possible solution providers, and sample their offers yourself. Use it, test it, ask questions about it. The ideal situation is where the solution you want to affiliate sell is a key part of your own business model, you use it extensively and know a lot about it. Whether it’s a billing program that helps you track payments or a blogging community that gives you answers, document the positives of the offer and—also key—what makes it a great value for the money. Once you’ve road-tested a product or service your readers have said they need and confirmed that it’s terrific, it’s time to tell your readers about it. Not in a salesy way, though. Simply start reporting on your experience. For instance, I created a series of blog posts about my experience in the paid blogging community and documented how it was helping me improve my headlines, attract subscribers, and solve technical blogging struggles. These posts aren’t just a chance to educate your readers about this affiliate offer—they also humanize you and make you more relatable by showing how you’ve struggled to solve problems your readers may also be grappling with. Another popular approach that works great once you have several affiliate offers is to do a post that’s a list of the tools you use in your business—tools you affiliate sell. Readers view these more as a “peek behind the curtain” opportunity, to see how the sausage is made at your online business than as an obnoxious sales pitch. It feels natural to have affiliate links on posts like these, not spammy. This is light years away from using AdSense. This is posting a hand-curated offer for items you have vetted. Readers can feel the difference. One note: Don’t go dropping sly affiliate links into posts without disclosure. If you’re going to pop affiliate links into all your blog posts routinely, you’ll need a global disclosure at the top of your blog. 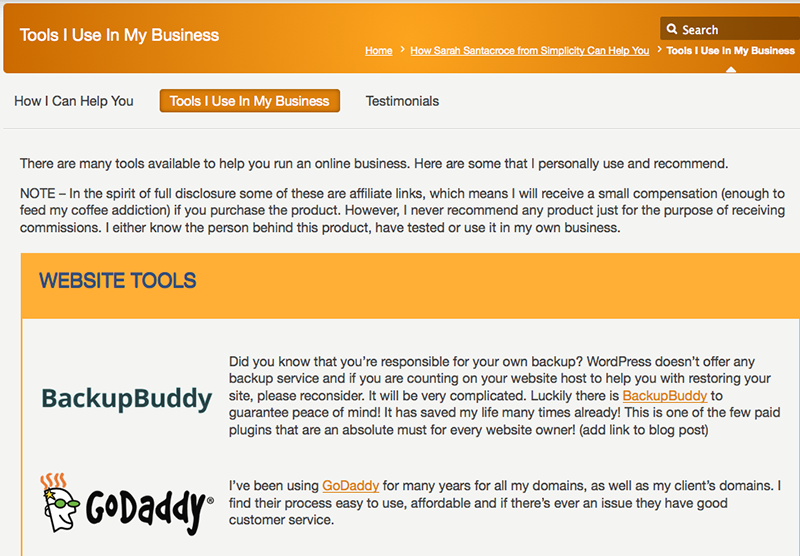 But my recommendation is to save the affiliate plugs for select situations, where you make a point of disclosing it. Either way, be refreshingly honest—readers will respect that. Once you’ve identified reader needs, found some solutions, tested them out, and written about your experiences, you’re set to make some serious affiliate sales to your small audience. You won’t have to send a single marketing email, either. How do you do that without slapping up a lot of banner ads all over your blog, or making every blog post about the offers you affiliate sell? There’s a low-key way to present them that’s inoffensive, persistent, and effective. A “Products I Love” page is a subpage of your blog, where you can sell affiliate offers in perpetuity with links back to those testimonial or roundup posts that document your success with the solution. You’re not actively emailing out about these products. They just sit on your site for readers to discover. 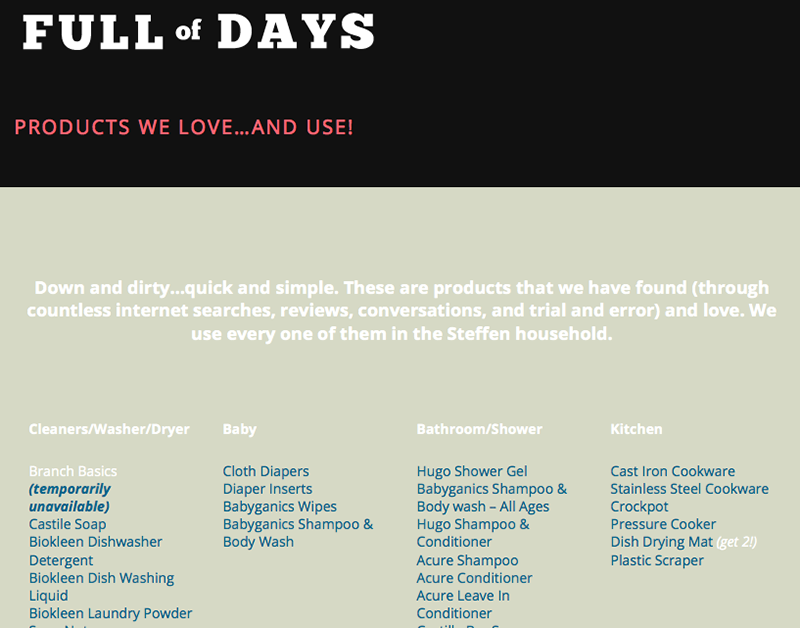 I’ve never had a single complaint about my Products I Love page! And your person­al testimony that it’s truly a worthwhile product or service counts for a lot. Before you list your affiliate offers, you’ll need to get readers oriented. What’s this page all about? Why are these the items you recommend? Don’t just throw your offers on a page. Lead readers down the path of understanding why you are turning them on to these particular solutions. You’ll want to tell a bit of your personal experience with each solution as well, so you can get into more detail. Be a live human being with a real story on this page, and readers will be willing to check out your offers. 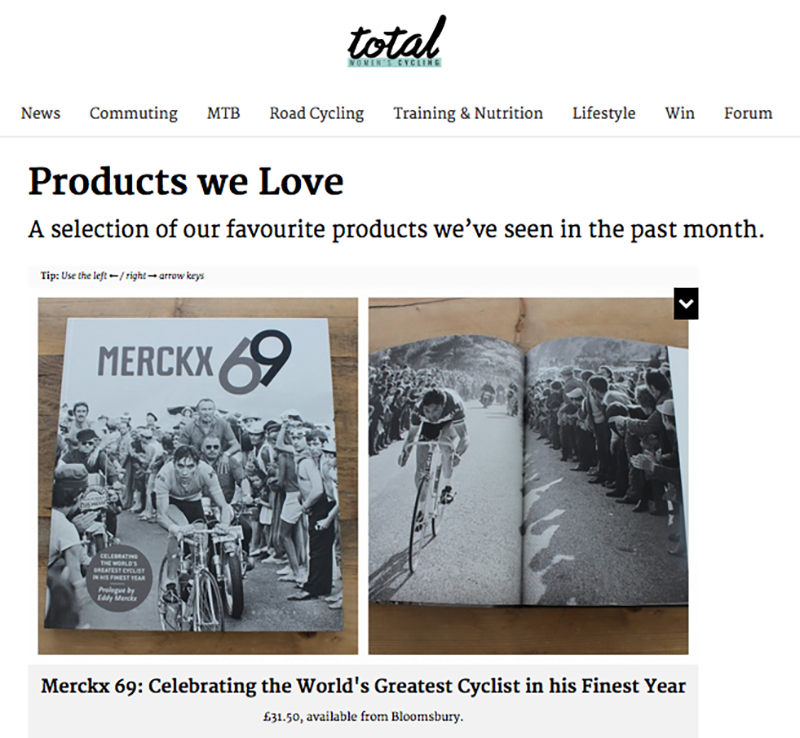 If you’re a product or course junkie who’s always surfing around for the latest-and-greatest, you might also curate a “Products I Love” page of the things you discover each quarter or month. Whatever your criteria for choosing your affiliate products, make sure your disclosure complies with FTC rules. It needs to be clear, prominent on any page with affiliate offers, and require no action by the reader (mousing over or clicking) in order to view the disclosure language. One final twist that can boost your affiliate sales is to solicit special discounts or deals for your audience from the companies whose offers you affiliate sell. You see Pat doing that above with his BlueHost deal. If you see you’re doing well selling a particular offer, contact the seller and see if you can get your readers an exclusive—they will love you for it! If your audience responds well to your Products I Love page, it’s a sign that you might also move up and actively sell higher-priced affiliate offers via full-blown email marketing campaigns, co-hosting Webinars, and other more aggressive sales tactics. If you’re just starting out in affiliate sales, don’t clobber your readers over the head with a $1,000 offer. Start slow and test the waters, so you don’t annoy your subscribers and make them leave. The ideal is to find products that have a free trial for an affordable product or service where your people can start without paying, at no obligation. For me, the free trial Freshbooks offers helped make me into one of their top affiliates! My people love to try before they buy. Barring a free trial, a low-cost item is a good starter. The blogging community I affiliate sold was $20 a month, no obligation—pretty low-risk to take a flier on that. It’s a basic law of marketing that cheaper things are easier to sell, so choosing affordable offers means you won’t need to sell as hard and can avoid alienating your audience. One of the best ways to earn well in affiliate sales is to sell a recurring monthly or annual membership product, where commissions continue to be generated as long as your people stay on the program. That way, you sign your people up once and keep earning commissions for as long as they stay in. As you sign up more people over time, your monthly earnings from that affiliate offer will keep compounding. When you share an affiliate link to something you’ve used yourself, you can authentically recommend it. And that’s the easiest and most ethical way to affiliate sell. Yes, that means turning down a lot of potential opportunities. But remember, offering your list a product that turns out to be low quality isn’t worth the unsubscribes you’ll see and the hit to your reputation. 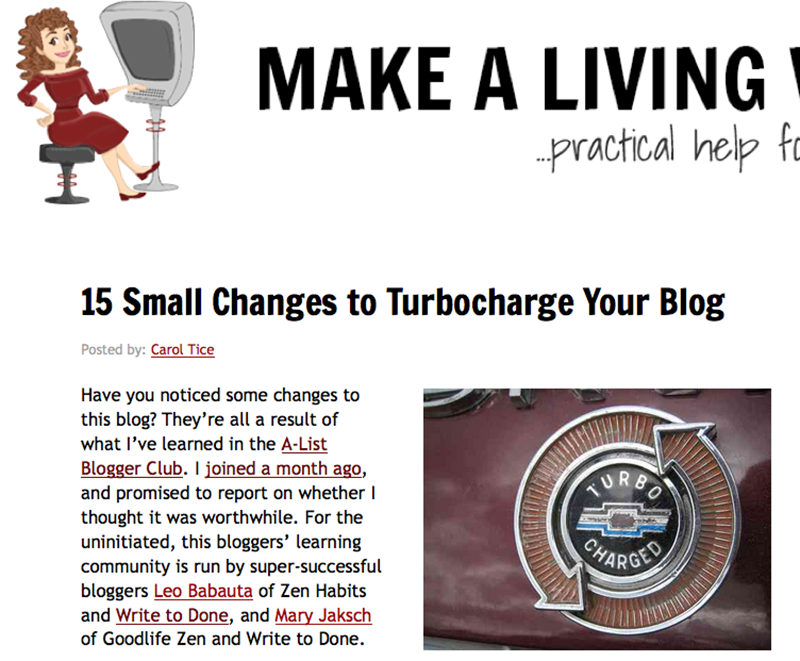 Carol Tice’s new e-book is Small Blog, Big Income : A Niche Blogger’s 7-Step Success Formula. She writes the Make a Living Writing blog. appreciate the feature of my ‘tools I use’ page, thanks Carol ! Enjoyed your post! Some great ideas to still make some affiliate income but doing it in a way that still builds community and trust among your readership. Thanks! I’m still figuring all this stuff out and the simplicity of this post made is so easy to understand that I’m going to get on it right away! Ofcourse this article was another good info I got from you Carol. Thanks! 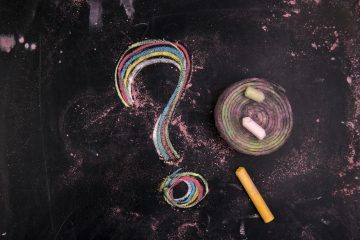 I am new and have a question: when offering something from affiliates that suppose that I first need to negotiate with them the conditions and in some way when some of my visitors clock and purchase their product they should know who to pay what? Mike — most affiliate programs make you an offer — we’ll pay 30% commission on this $79 product, or some such. They’ll take a look at your site and see if it’s one they want to be associated with…but all this means you’re looking at random affiliate offers. Remember, in the ideal, you’re affiliate selling products you’ve used yourself, and you know the people who made them, so it’s usually an easy conversation. Either way, you know what the terms are when you sign up. And yes, you’ll have a unique link that gives YOU credit. Thanks for your post Carol I wonder wether the affiliate selling through email marketing would not be more effective in terms of earnings , because we do not need a traffic strategy to drive audience to the blog , they automatically get the mails in their box ? would like your advice !! Well…sure it would be. If you HAD a list. Most startup bloggers don’t have much of an email list yet…and if they mail them 20x about some affiliate offer, they’re all going to unsubscribe. That’s the beauty of the ‘products I love’ approach — it can also catch visitors who haven’t subscribed yet, and you’re not wearing out your list emailing them. Another gem by you Carol. I will show this to my web master and partner of my bookcoaching.com site and the new VIP pages coming. If you have an affiliate link, I’d like to just click and go there, so I can offer some of your tools that can help my large book writing community. I think you’d be a star of my upcoming “Book Writers’ Mastery Course in October. Still a faithful fan even though I’m not a freelancer. You are the best of the best for sure! One of the biggest challenges facing affiliate marketers right now is the need to prove their value as middlemen in the value chain. One of the biggest advantages affiliates have over established brands, and one of the greatest opportunities to add value, is the ability to be agile and act quickly with content marketing. Thanks for the helpful stuff, it’s really useful for newbie affiliate like me, I bookmarked this article for my further reference, keep doing this great work.